In recent weeks we have heard some interesting rumours about Intel Coffee Lake processors and the platform, both good and bad. The latest leak is firmly in the 'good' category but requires a pinch of salt, as it's from a little known Chinese BBS, via VideoCardz. Intel Coffee Lake processors and supporting motherboards are due to start arriving from as early as Q3, according to the above roadmap. Initially accompanying the 8th Generation Core processors for desktop (Coffee Lake-S processors), will be motherboards based upon the Intel Z370 Express chipset. According to other slides this chipset will provide 24 PCIe 3.0 lanes. This is in addition to the 16 lanes for PCIe graphics cards. That 24 PCIe 3.0 lanes figure is key to the arrival of several enhancements touted for the platform. Previous Intel consumer chipsets limited such general purpose lanes to 8 or 12. With the extra lanes available motherboard designers will be able to implement more bandwidth-heavy onboard devices and connections such as multiple M.2 and U.2 storage options, and additional USB 3.1 and Thunderbolt controllers. You can see in the over view slide that there are, as standard, up to 10x USB 3.1 ports of which 6x can be USB 3.1 gen 2 (10Gbps). 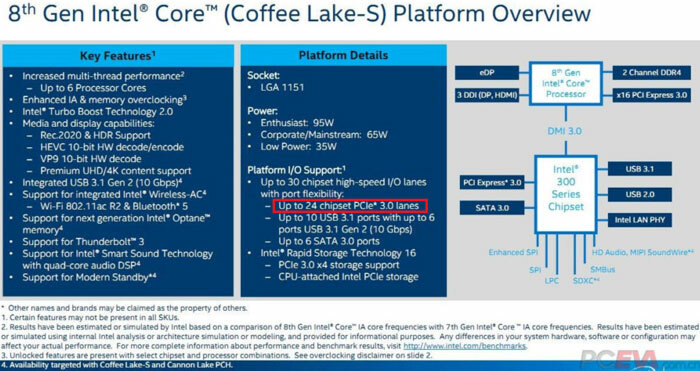 Looking further at the overview features slide, above, indicates that Intel will be releasing Coffee Lake-S processors with 95W, 65W, and 35W aimed at various parts of the market. Another interesting development is a significant push into higher quality onboard audio with the support for Intel Smart Sound tech and quad-core dedicated audio DSP. Mainstream and value variant Intel 300 series platforms will only start to arrive early next year. So, with a probable 8 core RYZEN Zen2 on the horizon they are stuck with max 6 core variants? That 24 PCIe 3.0 lanes figure is key to the arrival of several enhancements touted for the platform. Previous Intel consumer chipsets limited such general purpose lanes to 8 or 12. Intel still has higher IPC and higher maximum overclock rates than Ryzen. At present the i7 7700k gives better gaming performance than any Ryzen chip. This will likely continue to be the case with Coffee Lake. It will even “likely” continue to be the case after Zen2 appears, though that is less certain. What is more certain though, is that Intel's iCore will also continue to be significantly more expensive than AMD's Ryzen, including on a price-to-performance ratio.